What I am up to? Did you notice that I have been mostly playing (or having fun)? On other side of it, I have also been thinking what’s nex; I think, I have figured that out. At present, I am still involved with couple of projects mentioned above. I have also taken up a couple of interesting consulting assignments around technologies mentioned above along-with my old love (flash/actionscript). Amazon Cloudfront – Video Streaming (rtmp) Issue? Are you using Amazon Cloudfront for public/private video streaming over rtmp? Having trouble to figure out why some of your videos fail to stream (over rtmp) and throw ‘Stream not found’ flash/actionscript client side errors? Videos with invalid chapter markers would not stream over rtmp (Adobe Flash Media Server) or via Cloudfront. Adobe’s FLVCheck utility suggests our videos have invalid chapter markers. I am not sure, if chapter markers in our videos are invalid or Adobe Media Server expect those to be in different format. I am disappointed with the fact – Adobe Media Server ceases to play (core feature) a video because of (optional feature?) chapter marker(s) which can be ignored if it is corrupt or invalid. Thanks to AWS engineers who confirmed the case, and provided more details. Update: Thanks to Justin Riley for sharing a solution (in comments below). He suggested to use ‘-map_chapters -1’ to get rid of this issue. It works for me. This entry was posted in Actionscript, Adobe, Adobe Flash Platform, AWS, Flash and Actionscript, Video 2 and tagged adobe media server, aws, chapter, cloudfront, error, flvcheck, h264, issue, marker, rtmp, stream, streaming on May 29, 2013 by Abdul Qabiz. We have been working on some exciting stuff for over last three years, we want to take that to next level. We also have some crazy and cool ideas for new products/saas, we have got enough details figured out to get started. Summer vacation has started in most of the colleges in India; Some passionate students would want to do something more useful during this time. If you are one of them, why don’t you get in touch with us? BTW! We are always looking to hire smart and passionate designers and developers for our team. If you are interested into a full-time position, please let me know. This entry was posted in Entrepreneurship, Flash and Actionscript, India, Kanpur, Mobile & Devices, SaaS on May 6, 2011 by Abdul Qabiz. It appears to me (and perhaps others), I have distanced myself from Adobe Flash Platform during last couple of years. Not because I don’t like it, actually I love it, rather due to some other priorities here at our company, which does lot more (web-standards and design) than flash/flex stuff. All this time, I have been keeping very low profile in flash-platform community, literally not talking about anything. I feel bad about it, I don’t know ‘why’. I have done some trivial stuff (video players, flashlite and air apps) but nothing very cool or useful to everyone else. My to-do list contains a long-list of applications targeted towards Adobe Flash Platform (desktop and other devices), I am supposed to do; Considering, my plate is full with all other responsibilities, I am not spending even 1/4th of the time writing actionscript. Meanwhile, I have tried to encourage my team to learn actionscript and flex-framework. I even tried to hire some flash (or flex?) developers. I even managed to hire one flex developer last year. Unfortunately, this person left the company as soon as when it was time to contribute back after 6 months training (no contribution period). That was big set back, a discouragement to me; I stopped looking for Flash/Flex developers. I keep on promising myself, that I would do these applications; I keep on forgiving myself when I am not getting those done. Anyway, there is still hope, I would building applications the on language (ActionScript), I am very good at. There is still hope, this blog would have more posts related to Adobe Flash Platform. This entry was posted in Actionscript, Adobe, Flash and Actionscript, Flex and tagged Actionscript, Adobe, community, flash, flashplatform, Flex, hiring, kanpur, lessons, promises, team, update on January 12, 2011 by Abdul Qabiz. FlashDevelop is an open-source IDE for Flash Platform development (ActionScript, MXML, HAXE, etc.) on Windows platform. I have extensively used it in past, and still, painfully, use it via windows virtual-machine on OSX host. Couple of years back, I looked at FlashDevelop code to figure out, if we can port it for other operating-systems, such as Mac OSX and GNU/Linux. 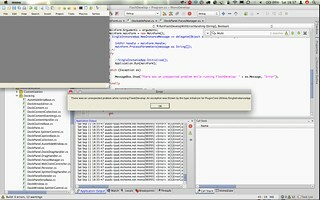 Run Flash Developer with Mono: I tried to compile FlashDevelop using MonoDevelop and run using Mono for OSX. Most of the problems is one component/library i.e. DockPanelSuite (http://sourceforge.net/projects/dockpanelsuite/), an opensource code that uses a lot of PInvoke calls (Win32 API). I am really excited about the possibilities, if we can port this one library we can get very closer to run FlashDevelop on OSX using Mono. Get rid of un-managed code (DockPanelSuite, etc.) and use managed code. Extend MonoDevelop to build FlashDevelop? MonoDevelop is good enough and works well on OSX, I guess also GNU/Linux. However, I am yet to look at licensing and possibilities of forking the project (MonoDevelop)? BTW! I have been lazy to write about such experiments on the blog, but while commenting on Jesse Warden’s post, I thought, it makes sense to post it here, so it lives. Please let me know, if you have any ideas about making this happen? I would be happy to collaborate, contribute and donate in whatever capacity I can. This entry was posted in Actionscript, Adobe, AIR, Flash and Actionscript, GNU/Linux, Open Source, OSX and tagged Actionscript, as3, flash, flashdevelop, flashplatform, Flex, gnu, ide, linux, monodevelop, opensource, OSX on September 11, 2010 by Abdul Qabiz. One more day to go for Adobe Flash Platform Summit 2010, I am very excited about this event because of so many good sessions and my team has been busy building some cool stuff using web-standards and lamp-stack. If you are going to be around, let’s catch up. This entry was posted in Actionscript, Adobe, Flash and Actionscript, Flex, India and tagged 2010, Adobe, bangalore, conference, designer, developer, event, flashplatform, India, summit on August 24, 2010 by Abdul Qabiz. Last year, I posted about Flex 3 In Action, a book by Tariq Ahmed, Jon Hirschi and Faisal Abid. Not many people know, I was also among authors but couldn’t contribute beyond one chapter due to personal priorities, hence opted out. Thanks to Tariq for trusting me and providing an opportunity. Tariq has again teamed up with different some smart guys (Dan Orlando, John C. Bland II, and Joel Hooks) this time, and all of them are working on Flex 4 In Action. All authors have a lot of experience and are great at what they do. I always prefer to read a book written by someone who has done the stuff, instead of someone who has just theoretical knowledge. I am yet to start reading draft version of the book, however, I am sure this book is going to be one of the best. To believe me, you need to check out authors’ profiles/websites and you would realize it yourself. Sign up with Manning’s early access program (MEAP) and start reading chapters (completed as well as drafts). This entry was posted in Actionscript, Adobe, AIR, Flash and Actionscript, Flex, RIA and tagged book, fia, flashplatform, flex4 in action, manning, meap, tariq ahmed on June 18, 2010 by Abdul Qabiz. Peter Elst posted his thoughts about ActionScript and where it’s going. I agree with him and prefer to have simplicity we had once with ActionScript and Flash Platform. We have witnessed how Flash Platform evolved over the years, it has got more attention by people but at the same time, it has lost a lot of attention of those attached initially (as Keith said above). Jeff Raskin, in Humane Interface, said something like that – complex tasks would require complex user-interactions but that’s no excuse to make simple tasks complex. I believe, that’s what has happened. It’s not any more simpler to do simple things. Adobe must think why they are doing it and for whom they are doing. If ActionScript is going to be clone of Java or C#, then why a new language – why not just use one of those? There must be a philosophy behind a language and platform, what is that behind Flash Platform and ActionScript? I had more fun in old days than now, just enjoyed the company of everyone (designers, developers, trainers, etc). It was because of simplicity that brought all of us together. I agree a lot of bad implementations were result of ease of doing things in Flash, but hey – there were far more good stuff then than now. A lot of innovation, cool stuff and apps to showcase. How much do we have now? This entry was posted in Actionscript, Flash and Actionscript and tagged Actionscript, Adobe, flash, flashplatform, simplicity on August 9, 2009 by Abdul Qabiz. Mrinal Wadhwa started a discussion, in Adobe India Community Champions mailing-list, to raise concerns about Adobe India’s role in Flex India community, he raised some good points. It’s unfortunate to see how one of the Adobe evangelists took it personal and reacted publicly and made some personal attack on Mrinal. You can check out Mrinal’s post to read what happened. This is what I posted during discussion in the mailing-list. My two cents after reading entire thread. 1) Adobe India works differently, the hierarchy and culture is different. More focused one engineering and marketing (to whom – God knows) than anything else. So any such event is aligned with sales and marketing needs. A lot of people who work enjoy their work but beyond that they don’t do much. A lot of them even maintain low-profile for various reasons. 2) Adobe India Evangelist team works differently compared to their counter parts in USA. In India, they report to engineering director of Flex or platforms team, which is not the case in USA, if I am right. 3) Expecting Flex team engineers to participate would be too much, it’s individual’s curiosity/passion to do that. If their managers make it as on objective/gaol, most of them would show up for sake (performance review, appraisal, etc) – we don’t want that. I have been through it and opposed the idea when my manager wanted entire team to do what we (Manish and I) were doing our own, due to our own curiosity. I have always asked these questions (what Mrinal is asking) to myself and during discussions, but could never really understand. I have learnt that it’s better not to expect much from the Adobe India, it’s not really Adobe USA. Culture comes from top to bottom, and top management is not really anywhere close to what it’s in USA. I like Evangelists in Adobe India, most of them are passionate and are there because they love technology and what they do. Unfortunately, when you work for a boss who got a different agenda or things, you can’t do much. As said earlier, Evangelist team reports somewhere to engineering director or someone like that, now you can imagine things. These are some of my random, but based on my observation and experience, thoughts. No offenses meant to anyone. I am keeping kind of low profile myself in Flex community, I realize community is doing good – there are far more developers than we had couple of years back. I also see there are far more passionate developers than before, you can judge that by seeing some regular names in lists/forums. I expressed above based on my observation and experience, might not have been put properly as I wrote it quickly. But you might get my point there. This entry was posted in Adobe, Flash and Actionscript, Flex and tagged Adobe, champions, community, controversy, India, mrinal wadhwa on July 19, 2009 by Abdul Qabiz. I just caught this news “Adobe Flash Builder instead of Adobe Flex Builder as a name for Gumbo” over AXNA. I felt like writing my views on this i.e. renaming Adobe Flex Builder to Adobe Flash Builder for future releases. I kind of like it for reasons explained later. I loved the move when, recently, Flash Platform was redefined. It brought a lot of clarity and removed the confusion built since Adobe (Macromedia) Flex was introduced. A lot of people were confused and didn’t really think that even though there were different development paradigm but all targeted to Flash Runtime(s). I have been using the term for sometime, even before Adobe redefined it to bring all these different technologies/tools, which targeted Flash Runtimes (Player, AIR, FlashLite), under it. I think, sooner or later Flex SDK should be renamed so no such confusion develops further. Having consistency increases simplicity and clarity in understanding things, developing, learning, talking and building brand. It would be nice to have one framework with many sub-frameworks targeting various different Flash Runtimes and development tools (Adobe Flash Authoring tool, Adobe Flash Builder, etc). We need consistency that leads to shorter learning curve and better development platform, eventually. This entry was posted in Actionscript, Adobe, AIR, Flash and Actionscript, Flex and tagged Adobe, branding, flash, flashbuilder, flexbuilder on May 17, 2009 by Abdul Qabiz. I need a Adobe Flash CS4 Professional upgrade license because some projects need to be updated. I can not order online from India. I really don’t have time to seek a resellers help on this, I know it would take weeks to get the license. I requested a friend in USA to buy it for me, he has been trying to do that but it seems Adobe store application, which is done in Flex, throws a lot of errors. A few things, which I have reported in past, like asking for exact address (line by line). In this case, I guess, store application requires the address even when you choose Paypal as payment option? I don’t have exact details in hand now, but I can see my friend has been having trouble buying Flash CS4 on Adobe store. I know this friend of mine, he is a developer himself and very good at things, so I know,he is doing right, I would rather say, store-application is not done well. He has recently helped me getting a FlexBuilder 3 upgrade license and he had problems even then. It took two days and various attempts, perhaps a phone call also, to get that license. No wonder, why people blame Flash Platform for lack of usability and accessibility, most of the times it’s the developers who don’t implement things correctly and platform gets a bad name. I have also started feeling, why can’t stores have multiple options – I might want to choose simple html interface, if I am on mobile or slow connection? Yet another frustration and my project is delayed by now. I could have bought license earlier, if I knew the requirements earlier. I hope someday, Adobe and Apple would realize that they can help thousand of people like me, by just enabling online purchase, even if it takes order and makes me send cheque/bank-draft to them, if not credit-card/paypal integration. I hope someday, these companies would realize that most of people in countries like India don’t have access to real stores/resellers in their cities or states. Yes, I happen to live in a city where it’s hard to get things, I have to travel, at least twelve hours (round-trip) for even simple purchase and with no certainty, I would get the stuff at the stores, whichever is there. I hope, these companies help to reduce the piracy in India. I hope, these companies realize they can make people do the right by being more accessible to them. I wonder, what is holding these companies? Is it sales guys who don’t want to have an online store? Is someone getting some favors from resellers? I don’t get, why to have a middle man in this age, when an online store can enable a lot of users, not only buy but also have faster access to things. I can not believe it’s tax issue or things like that, it’s lack of will to do. I am sure, there are other stores running well here in India. This entry was posted in Adobe, Flash and Actionscript and tagged accessibility, Adobe, flash, flashplatform, India, licensing, paypal, store on March 25, 2009 by Abdul Qabiz.